The RCMP Musical Ride is a world renowned show of skilled RCMP members and their beautiful horses. The tradition, which began many years ago, allows them to be ambassadors of goodwill promoting the RCMP’s image throughout Canada and the rest of the world and has been doing so for many years. The Musical Ride performs between May and October every year and by visiting up to 50 communities, their performances help raise thousands of dollars for different charities in those cities and towns. Kamloops was one of the fortunate ones to be able to see them this year and upon entering the venue, we were given a program which included so much information and history, much of which I have shared here. The North West Mounted Police began in 1873 and used horses to do their job in those days. Out of boredom, they began using their drills and tricks to compete among themselves and in 1876 performed at Fort McLeod, Alta, which is likely their first public appearance. This evolved into the Musical Ride. The first riding school was established in Regina in 1886 and during the winter of the next year, five performances were done at the barracks there. Later that year a fire demolished the riding school and the depot and the ride did not resume performing until 1901. The first time the Musical Ride was performed outside of Western Canada was in 1908 and held in Quebec City for their 300th anniversary celebration. This was also the first time a member of the Royal Family was to see the ride as the Prince of Wales was present. The Musical Ride was cancelled when WW1 broke out in 1914 and did not resume until 1920. By then the NWMP was now the RCMP with headquarters moved to Ottawa, Ont. During that first year, there was another division which added to Regina’s and there were two performances done by the Musical Ride. A third division was established in Vancouver in 1930, and this division would perform there. The Ride first performed in England in 1930 and by 1934, it was performing in the United States. These continued until the WW2 outbreak. They did not perform again until 1948 but have been performing worldwide ever since. It is performed by a troop of 32 and their horses and consists of a choreographed series of drills and done to music. There is no doubt there is a lot of training done in order to have such control and coordination for the riders with these horses. There was a time that it was mandatory for all recruits to have this training but only those assigned to the Musical Ride now get it. It has been many years since we’d last seen the RCMP Musical Ride and as much as we enjoyed seeing them again, I was disappointed in the venue. I’d read that the seating allowed 3,000 but bring lawn chairs should those seats be taken. We did manage to get there a bit early but there were perhaps half of that number of seats available (shown on the city’s ad) and all were taken. Sitting in a lawn chair does not give anyone a true picture of the actual drill that these skilled horsemen and women are doing, but aside from that....... their performance was flawless and amazing! July 1 is the day the Canadians celebrate Canada’s birthday. This year brings an even bigger reason to celebrate as it has been 150 years since the Constitution Act was enacted. When formed in 1867, it was called the British North American Act then was renamed in 1982, the year the Canada Act was passed. Kamloops has drawn a huge crowd for our annual celebration at Riverside Park to celebrate the 150th birthday. There were vendors with art that shows the talents of many local artist, too many to mention but a very impressive gathering of excellent art in many forms. July 10 - 29, 2017. We enjoyed the Wizard of Oz last year and look forward to seeing The Jungle Book and Rapunzel this year. For tickets and info click here. This scene is a great change from only a few weeks ago when the river water was so high it reached the sidewalk edge. The level is now much safer and allows for swimming and boating on our Thompson River. 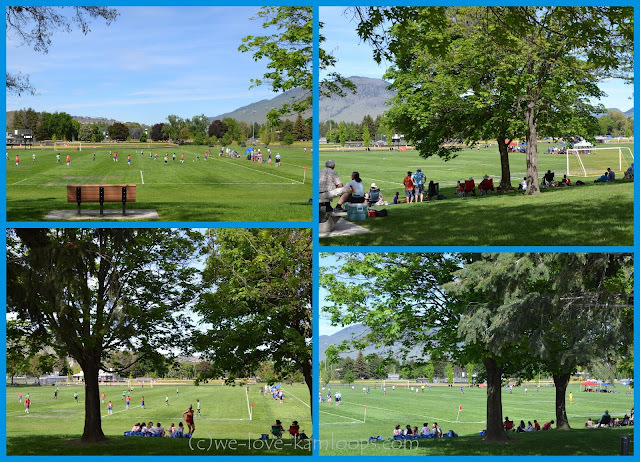 There is no shortage of entertainment nor young ones to enjoy the waterpark, playground equipment and bouncy castles in the shade of the large old trees in Riverside Park. The lineup for face painting was a long one. The Kamloops Multicultural Society hosted a Folkfest at the park with cultural displays and international food booths. A great opportunity to try something new. There was a great flag display in front of the bandshell and large tents that offered shade for those who wished to have a chair to sit in for the entertainment and speakers who were there to offer greetings on this special birthday for Canada. There was no shortage of the color red nor of the maple leaf which signifies our flag. The red and white was amazing to see and added to the celebration feel to the day. The park was so full of people wearing special clothing that there could have been a fashion show of patriotic clothing! The RCMP were represented at this ceremony and this gentleman in red serge led us in the English version of pledging allegiance to Canada. All who were there, stood with their right hand raised and repeated after him. We remained standing and he was followed by another RCMP who did the same in French. Thankfully, she did tell us we did not have to repeat after her. I heard several sighs of relief. Happy Birthday on this special 150th year of Canada becoming a nation. A large cake was waiting to be cut and shared among those who were participating in this celebration. Many acts of entertainment were held at the park including Pokotillo Ukrainian Dancers and the Desert Sounds Harmony Chorus following the introductory speeches. Lots to enjoy and much to see. The day ended with a fabulous fireworks display. We had learned of the Kangaroo Creek Farm a few years back but had not yet been there for a visit. 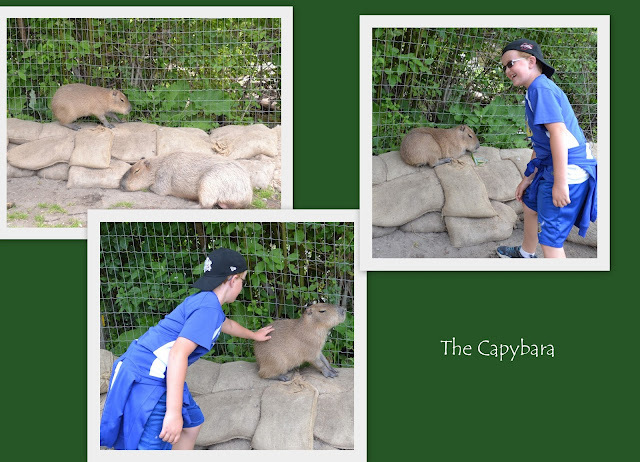 I was waiting for the opportunity to visit here with our young grandsons and although one of them was not able to join us, we set out with the 7 year old to enjoy a visit with the kangaroos. The Kangaroo Creek Farm is a private farm that has been keeping kangaroos and wallabies for over 20 years. They opened for this season in March and will be open until the end of October every day from 10am until 2pm. The months of July and August are extended hours. They charge a very affordable price for entry, children under 5 are free, seniors and youth only $5, adults $10 and there are no other costs once you are on the farm, unless you choose to buy a cold drink available at their concession. No gift shops, just lots of animals to spend some time with up front and personal. This very large rodent is a native of South America and the largest rodent in the world. The most familiar rodent I can relate him to is the guinea pig, which we consider pets in this country but these live wild in their homeland. The smaller one enjoying his petting is almost 8 months old. His dad, lying nearby blended in with the sacks and just kept on napping, oblivious to the activity around him. 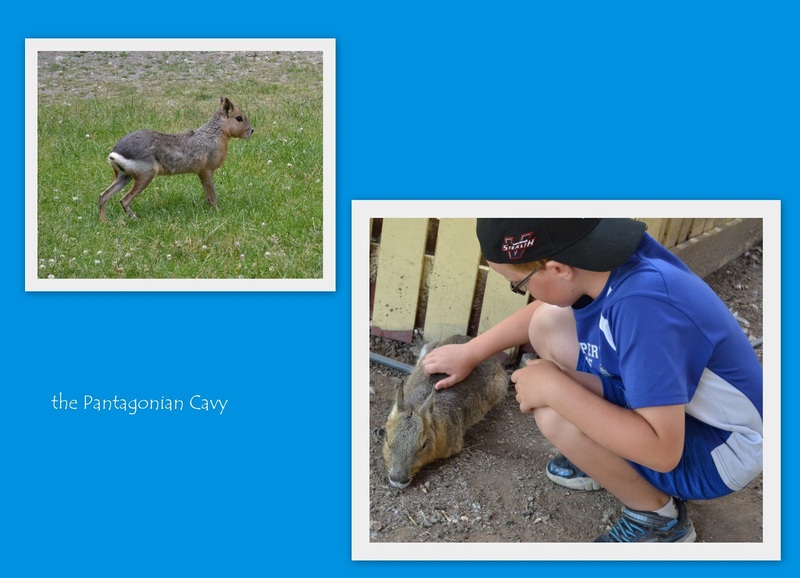 The Pantagonian Cavy, known also as a Mara and so much easier to remember, is from Argentina. It is amazing how well all of the animals at Kangaroo Creek Farm have adapted to their human visitors, young and old. There is no reaction when someone approaches to pet, they seem to enjoy it all. Being the fourth largest rodent in the world, they are also related to guinea pigs and the capybara but are more similar in looks to a bunny and a deer, whom they jump like. The enclosed field where the kangaroos and wallabies are found has a ‘western town’ to add to the fun of this adventure. 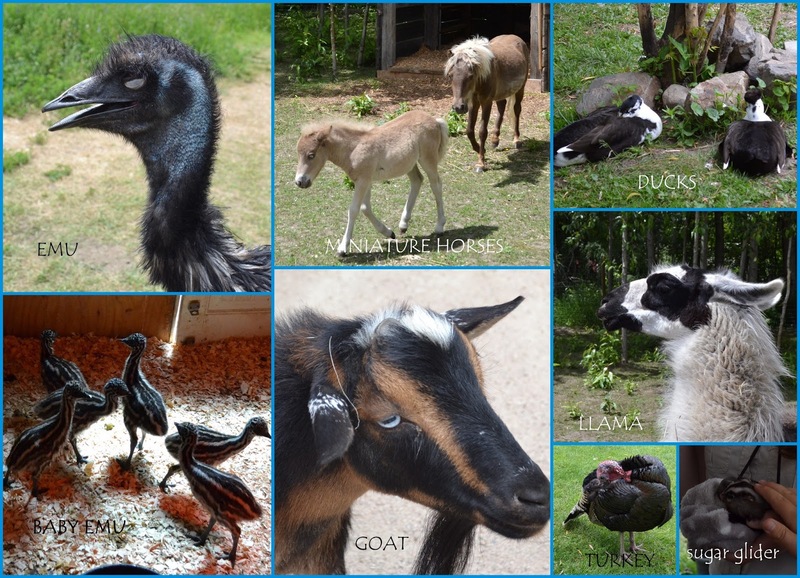 We are free to wander around visiting with the many staff members who are very willing to tell you all about the animals including each of their names. They carry branches and treats and will give them to you to feed to the kangaroos and wallabies as the animals wander freely around the area, too. This peacock, whose name I’ve forgotten seemed to think he was the boss. He would put the run on the kangaroos, although these two were quite patient with him and ignored him until he went away. One of four kinds and the largest of the species, this is the red kangaroo. Known to be from Australian where the kangaroo population was 34.3 million in 2011, we were excited to be able to pet one of these special fellas with the soft coat. These young ones can grow up to be 6 feet tall and weigh 200 lbs. The wallaby is the smallest of the species and weighs up to 18 kg (40 lbs). The diet for them as well as the kangaroos is mainly grasses, weeds, roots and green leaves. The many staff on the farm are ready to give you a branch of willow leaves to feed the wallabies or their favorite treat, a chunk of banana when they get their fill of leaves. Irwin is a young male albino wallaby. Being albino, he has no color in his skin or eyes. He kept his eyes closed for much of our visit with him, they would be sensitive to the sunlight, but he didn’t hesitate to take the leaves and the banana, once he was able to smell it. What a thrill to be able to hold a joey, the babies of the kangaroo family, while visiting the Farm. 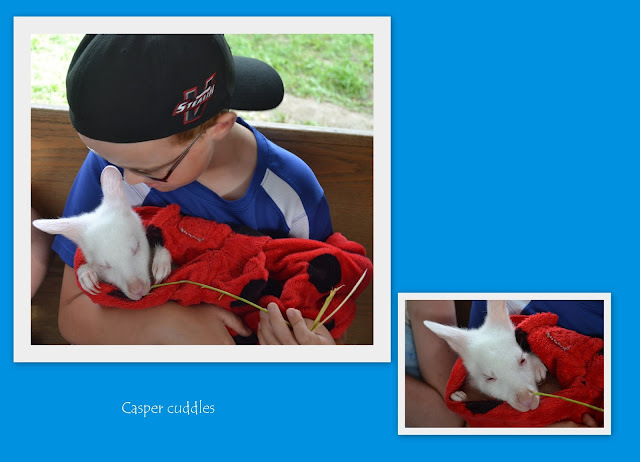 There were several of them but our grandson was holding the one albino of the group, whose name was Casper. He was able to hold him for a few minutes while giving him some nibbles and a cuddle before Casper was passed to another of the long line waiting to have their own cuddle. There is quite an variety of animals on the Kangaroo Creek Farm other than kangaroos that enjoy the visitors, too. The baby emu were only 2.5 weeks old so not outside yet. The large emu enjoyed visits as he wandered about. They goats are friendly, always looking for treats. The Sugar Glider of the possum family is so tiny. The llama and horses are in their own corral. 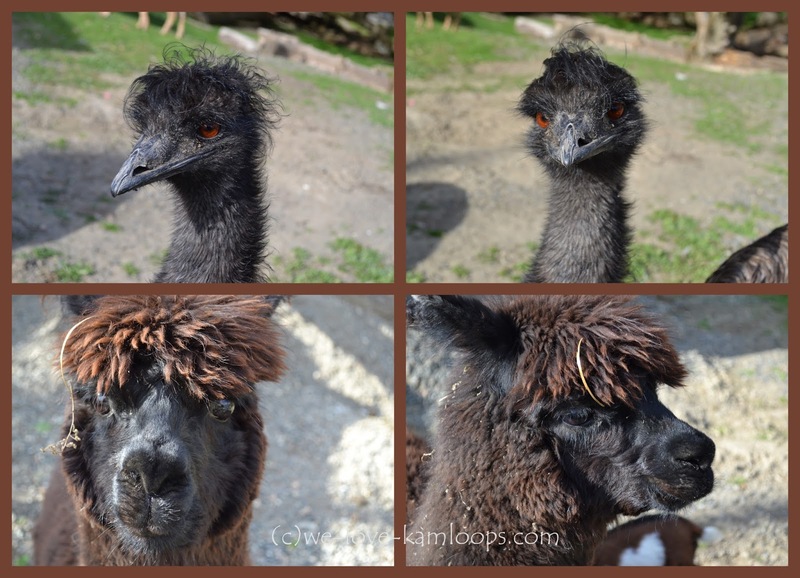 The Kangaroo Creek Farm has some great information and related links on their webpage about all the animals we were to see on our visit there and I recommend, should you be interested to learn more, that you check that out. They are located on Main Street, one block behind the A&W in Winfield on Hwy 97. Parking is on the street but there is also limited handicap parking down the driveway on the Farm. Flooding is not new to Kamloops but the threat of it still creates fear of the possibility of it happening again. The fact there are two rivers meeting at Kamloops only doubles the chances. This winter there was a lot of snow up in those mountains, then we got some cool days with quite a bit of rain, and then the hot weather speeds up the melting. Mix all of that together and we have a flood threat in Kamloops. The parks are feeling the high water level, although that hasn’t stopped people from visiting the parks. The wharf at Riverside Park is at water level, when it is usually several metres above that. The railings have been removed to discourage any visitors onto that so barely visible. Normally there is a very large sandy beach between the sidewalk shown and the river’s edge. This shows the water to be about as high as we’d like to see it come up. At this point, the damage appears to be extremely minimal. There are white bags sitting on water grates all over the city that will hopefully prevent any water coming up through those grates from the storm drains. Water in this parking lot at the east end of Riverside Park is fairly shallow so many are enjoying the walk through the water. This monument shows the water heights throughout history but also the height of the water for the floods we’ve been through. The one that we personally lived through was in 1972, 3 weeks after we’d moved into our new home. More info on this from a previous blog I had written here. Typically one would be able to follow the path under the bridge that would then take you to Pioneer Park, which is mainly covered in water on this day. At this point, the railway bridge is not in any danger from the rising waters. Many people were at the park enjoying this sunny Sunday with their families, many of which were playing in the water, and it was not only the young that were playing. The boat launch at MacArthur Park has been closed due to the high waters, although the next photo shows a small boat tied to the small wharf, which is usually many feet lower than it is now. Signs do not always work but at least this boat is not out on the river, which would be quite dangerous to maneuver. At this point in time, the North Thompson River has been said to have crested, meaning there is no longer a danger of flooding. The South Thompson River has not crested yet, but had dropped several inches since these photos were taken. 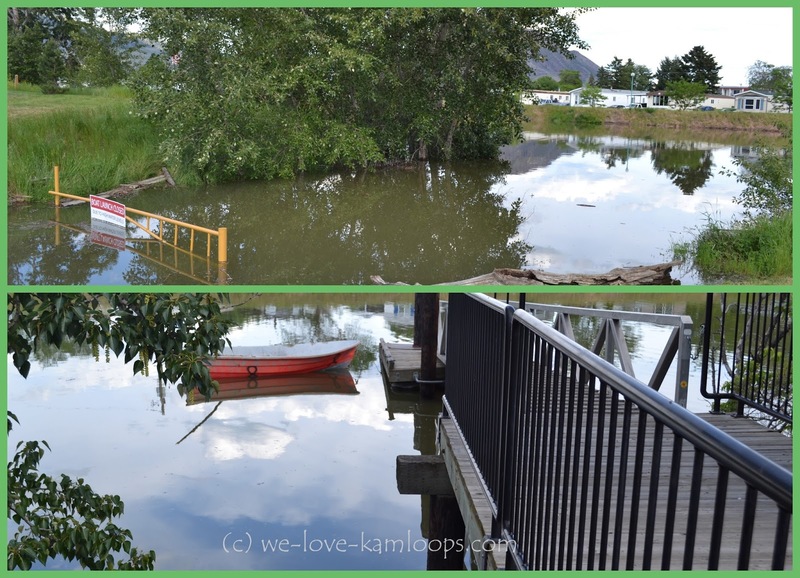 The threat of flooding has lessened and hopefully will allow Kamloops to get past this point, once again, without any damage done by flooding. We are slowly seeing the signs and reaping rewards of warmer weather. 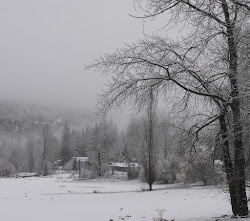 The typical trials and tribulations of rising water from winter run-off is still reminding us that summer has not arrived yet but our May long weekend was a great one for weather. We’d made an early May visit to McArthur Park and were able to see some very young and fuzzy chicks with their vigilante mother and father watching over them on the beach by the boat launch. I doubt these chicks were very old. I stayed a great distance away so as not to disturb them, I use my favorite lenses that allows me to get photos like this. These little fellows are fun to watch. 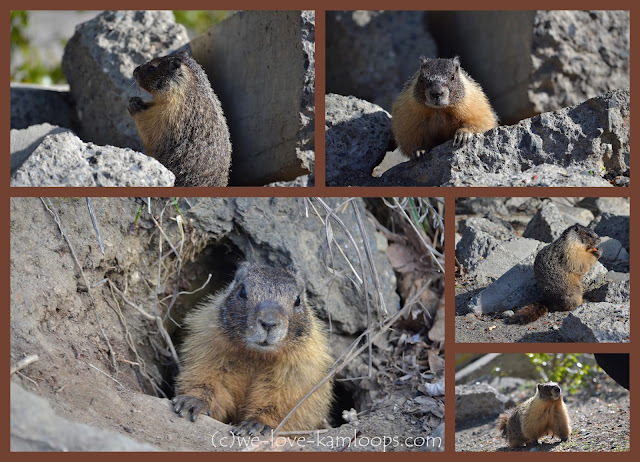 They are yellow-bellied marmots which are one of 14 recognized species of marmots. The others include woodchucks and groundhogs, which are the same. They are all a rodent related to ground squirrels and prairie dogs….. do I have you confused yet?? and the yellow-bellied are considered the king of these rodents, if I haven’t confused myself too much. On our next visit with higher waters, we saw none of them, their river bank caves must have been flooded and chased them away, but they will return. An early May visit to Little Farmers Petting Zoo at Westsyde Centennial Park with our grandson was a fun one. I love to see the faces of these two. The Emu is very interested in having a close-up look, although I am on the other side of the fence with the long lenses again. There are two of them and they are quite tall with a lot of oily feeling feathers. The Llama, which I believe this one to be fairly new to the park was interested for only a moment, I had to be quick with the camera. I would have liked to brush that straw out of his ‘hair’ but thought better not to try, he was more interested in grazing for lunch. The little ‘kids' are definitely a big draw here at the Little Farmers. We are able to buy some food for them at a vending machine there and feed them through the fence. Our little grandson loves to feed them all, young and old, they are excited but amazingly gentle when they take the food. One very pregnant goat was happy to just rest while a friendly Vietnamese potbellied pig (I believe) gave her snuggles. I just had to take a picture of these “3 little pigs” as they slept side by side in their house made of wood. An old nursery rhyme comes to mind! How they managed to get in there in this position would be quite a sight to see, I am sure it could take awhile. Afternoon naps are always a good thing. 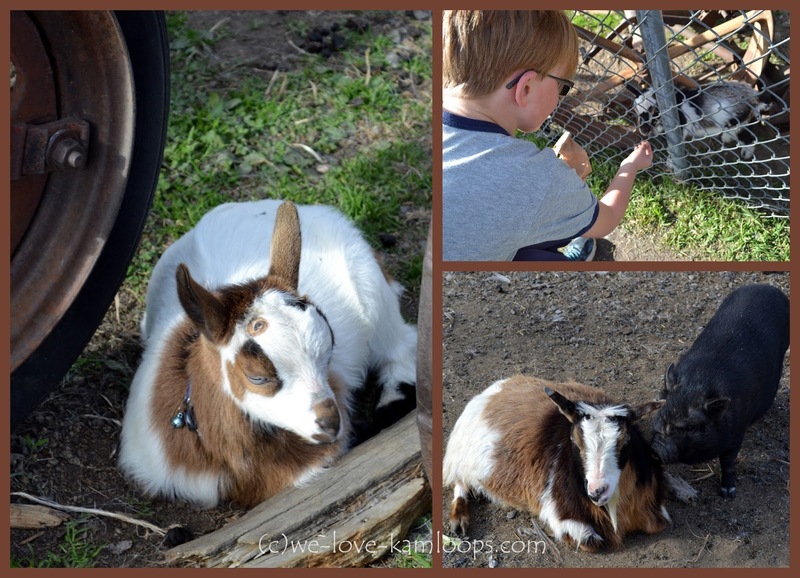 See more at the new webpage that the Little Farmer Petting Zoo is developing, it is a work in progress but tells you more: click here. The feathers of these two birds are absolutely beautiful. They are so perfectly marked, they move so quickly it is hard to get a full photo but they both have very long tails. The breed of the one in the top photo may be a quail and I took a guess that the bottom was a pheasant and by doing some research was able to learn it is a Golden Pheasant from New Zealand. He’s been here quite a long while now if it is the same one we’ve seen over the years. This turkey just could not be outdone after seeing our reaction to the beautiful birds in the nearby pen. He was showing off his feathers, too. We’d seen the white turkeys on an earlier visit but remember a Bronze Turkey from our visits over the years. One of those was quite a friendly fella and made the attempt to be sociable with me. To see him, click here. We are back at McArthur Park on the Victoria Day weekend in May and what wonderful weather it is for all the sport tournaments that are filling the park with all these athletes and their fans. There were several baseball games going on at the same time. The park was full and enjoyed by many. I am not sure a boat ride on the Thompson River is the best thing to do during high water times due to all the debris in there, but this boat was heading upriver at a good speed and seemed to be oblivious to anything but having fun. I am guessing it was too hard to resist the temptation on such a great sunny day. The signs of summer are happening and after what seemed like a long and very chilly wet springtime, we hope to get a summer full of great weather and enjoy the many treasures of our home town of Kamloops, B.C. 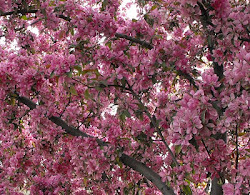 Springtime means new life in this wonderful nature that surrounds us. I wanted to get some photos of that once the weather permitted so when I read an article in the paper about the “frogs, turtles and ducks” at Peter Hope Lake, we made a plan to go there for a first time visit. Peter Hope Lake sits up at 1082 m (3549’) but in spite of the cooler weather we’ve had, the ice is gone and the lake has several fishermen out there trying their luck for the Rainbow Trout. There is a resort across the lake and the BCFS campground on the side we visit, which is surprisingly full of campers on this cool spring day. Now I take a closer look at this marshy area. Across the marsh and all alone are two Canada Geese quietly watching the sights. I do wonder if they have a nest on their little plot of land. I am surprised not to see more of them but perhaps the rest are down in the warmer areas. They say that the Redwinged black bird is the most abundant living land bird in North America, yet I’ve rarely seen them. The males are the only ones with the color so they do stand out and the female are a nondescript dark brown. They do seem to favor the marshy areas. This was definitely the first sighting for us of the Ruddy ducks. They also favor the marshy lakes and ponds. As the Redwinged Blackbirds, the females are “brownish” and so are the young males. During summer months, the males have a bright blue bill that is paler in winter. This male appears to be in transition from winter to summer colors. Their typical brood is 5 to 15 ducklings. I am familiar with the American coot. We most often see them down south during winter months where they enjoy the ponds on the golf courses. They are mistaken to be a duck but are not, their feet are built more for walking on dry land. The male and female look very similar other than a larger plumage on his head when he is being aggressive. Another bird not often seen in our neighborhood is the Blue Jay. By their main food, they almost sound like a squirrel, and they are known to hide nuts for eating later, as are the squirrels, too. This photo was taken quite a ways away so I didn’t even realize they were blue jays until I got these downloaded. A very nice surprise. The biggest thrill of the day was seeing these eagles across the field from the road as we headed back home. I only wish I had a video of the excitement we watched. There were only one adult and one young one but that soon changed and another adult and two young ones came to enjoy the feast. I did get a photo of one lifting the ‘catch’ (not shown and not a fish) and they did seem to be fighting over that. Wings spread and big jumps offered several photo opportunities. The young ones have a very large wing span so they mustn't be yearlings. Then there were more! Bald headed eagles mature at the age of 5 years and then will have their white head which means that the majority of these eagles are under 5 years. Eagles are more often spotted in trees but sat in this area for so long. I guess with the water running from the lake down through the fields, there may be some fish passing by, much easier fishing this way. We didn’t see any frogs on our travels today, disappointing but we did see some beautiful birds out there so it was well worth the trip. We do see lots of Canada Geese in our parks in the city and in our neighborhood the crows are the main resident and we have plenty of them. At least they are fairly quiet, nothing like our local doves, who love to sit atop the poles on the street and call. To reach Peter Hope Lake, follow Princeton-Kamloops Hwy/BC-5A from Kamloops towards Merritt for 54 km to Peter Hope Rd. Turn left onto Peter Hope Rd and follow for 8 km to the lake.